Marsa Mubarak offers an underwater experience of marine life such as crocodile fish, stonefish moral eels and maybe a passing turtle. You can often find some of the smaller coral reef fish hiding in the hard coral formations. 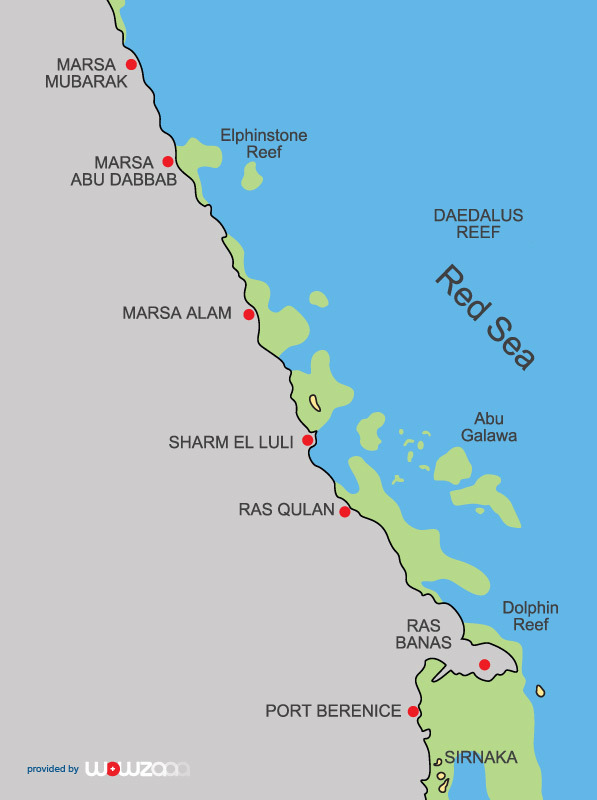 Another part of these seven reefs is Shaab Naba, a popular overnight location due to the close proximity to Elphinstone Reef. It offers a fabulous night dive and you are sure to see some lion fish. At Fury Shoals, dive Shaab Claude with its famous cave system which make an excellent swim-through dive, perfect for spotting moray eels and red sea bannerfish. There are huge porite corals and moving off the reef you may see a White Tip Reef shark or turtle pass by. Abu Galawa Soraya has a fantastic coral garden and on one dive you may encounter a wreck of a private sailing boat, packed with glass fish. Wadi Gamal, with its flowing banks of hard yellow and green soft coral has resident angel and butterfly fish, and in the right season huge schools of placid jack and tuna visit the area. Further north, you will pass by Shaab Sharm, with its wall dives and White Tip Reef sharks. Oceanic White Tips and Silky Sharks can sometimes be found in the blue and turtles often visit the South side. Samadai (Dolphin House) is a shallow turquoise water lagoon where a large pod of spinner dolphins live. In 2004, the Egyptian government made this reef a Marine Park to protect the dolphins. The western tip provides a large group of pinnacles rising to the surface from a carpet of seagrass, populated by schools of reef fish. Elphinstone Reef has sheer walls plunging steeply into the blue, decorated with soft corals, sponges gorgonians and fans. Sharks feed here on the abundant fish population and the southern plateau is home to white tip reef sharks.